A sailing rig increases your kayaking range. You can sail to an island or a new part of the coast, take down the sailing rig and explore the usual way. It also means you can have the fun of sailing with no more than 20 kg of extra equipment, which may cost very little and will easily fit into your car. Compare that with taking a sailing dinghy as well as your kayak away for a seaside weekend. 200 kg of expensive equipment including a road trailer and launching trolley, and you may have to find a slipway to get the dinghy into the water. Up to 5 knots a sea kayak is efficient and comfortable. A kayaker applies a force of about 3 to 5 kilograms with each stroke of the paddle, and a peak force of over 15 kg when punching out through surf. 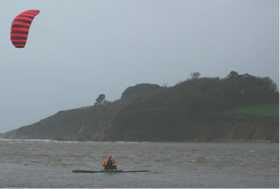 However a constant pull of only 1.6 to 2.3 kg is enough to move the typical sea kayak through the water at 4 to 4.5 knots. Even a tiny sail or kite is enough, and if you're happy to go more or less directly downwind you don't need a rudder. The modern equivalent is a purpose-made downwind sailing rig like the one on the left. They're used quite often with wide, stable sit-on-top kayaks. To use one with a 52-cm wide sea kayak you'd probably need to raft up with somebody, but some paddlers do use a 1.5 square metre sail on a classic sea kayak, on the open sea with no stabiliser. 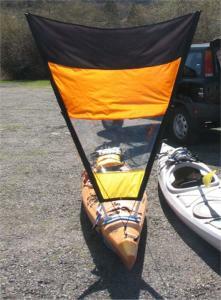 If you'd rather buy a ready-made rig, Windpaddle make a bowl-shaped downwind sail for sea kayaks. It stores as a flat disc on your front deck, but when you give it a flip of your wrist it opens up like one of those self-erecting tents to be 1.06 metres across. See Kayarchy Shopping. Alternatively you could take advantage of the stronger winds 30 metres up by flying a basic, stable non-steerable kite. Raft up with a friend for stability, send up a small kite and relax as you go gently downwind. If you follow a kite too fast it will fall out of the sky. You can either trail something behind your kayak to create drag, or steer with a paddle or rudder so that you go slightly right or left. Parafoil kites, illustrated below, are inflated to an efficient wing shape by air which is constantly rammed into the leading edge. Some sleds and most parafoils need no spars, so a small one like the Peter Lynn Pocket Sled will literally fit in your pocket. You may find that a small kite, just a children's toy of less than 0.5 square metres, is enough. The wind is a lot stronger and more stable 30 metres up. If you want more power for your downwind kiting, try a larger kite. You can get a parafoil up to 1.4 square metres for a reasonable price. Your direction depends where, along the length of your kayak, you attach the leeboard and how far in front of the centreline of the leeboard you hold your kite line. You probably won't be able to go any more than 60 degrees off the wind, but you can choose to sail on any course within the green sector which is 120 degrees wide. It's easier if you have a rudder as well as a leeboard. In 1987, Ed Gillett paddled and kite-sailed a Necky Tofino double kayak 2200 miles from California to Hawaii in 64 days. The wind was behind him most of the way, and for about 60% of the time he flew a Jalbert J-15 kite (a 1.4 square metre single-line parafoil) which added about 2.5 knots to his speed. A sailboat can't go directly upwind but it can maintain a course within 45 degrees of it and make real progress to windward by zig-zagging (tacking). The closer to the wind you steer, the more your sail tries to capsize you. You need some sort of stabiliser to sail upwind. Sailors deal with this in three ways. A dinghy sailor shifts his or her weight further and further upwind, often right over the side of the boat until his or her backside is dragging in the water. A yachtsman attaches a heavy weight (half a ton of lead) to the bottom of the boat. A multihull sailor attaches a rigid spar across the hull at right angles and attaches a float to the downwind end. The spar is called a crossbeam or iako; the float is called an outrigger or ama. Usually there is an ama on each side of the main hull. A handful of techy sailors use hydrofoils instead of floats. Also, the closer to the wind you go the more your sail tries to push you sideways, downwind (leeway). To resist this, you need a vertical fin hanging down into the water. A sailing dinghy has a slot in the centre of the hull down which the sailor thrusts a daggerboard, as with the International Laser, or which contains a centreboard which the sailor can pivot downwards when going upwind. That sort of fin has the additional advantage that when you make a sharp change of course, the boat pivots instantly round the fin. A beach catamaran relies on having hulls with a sharp underwater cross-section. If you want to make your own rigid ama and iako, plans are available from Chesapeake Light Craft. At the time of writing you can buy the large-scale plans for $69 from CLC or get free small-scale plans by ordering the July/August 1996 of WoodenBoat magazine (issue no. 131) from www.woodenboatstore.com. Contact details for Plasmor and CLC are at Kayarchy Shopping. Any sort of rigid ama is still too heavy and too complex for a lot of people, who prefer a lightweight sailing kit which can be carried inside a kayak and which folds, clips and inflates to make a sailing rig. Kits consist of a mast; sail; control rope; a pair of inflatable floats; a leeboard; a cross-beam and brackets to attach it to the kayak; and a rudder. With a rig like this a kayak can tack upwind. It will be too light and wet to make a really good sailing boat on a windy day, but the kayaker sits so low that he has a great impression of speed. Especially if he sails through a steep wave. Kayakers using rigs like this have made some long expeditions under sail, including one through the North West Passage at the top end of Canada. (Sailing a small open boat in the Arctic must be absolutely freezing... at least paddling keeps you warm!). See Balogh Sail Designs at Kayarchy Shopping. Like the wing of an aircraft, a hydrofoil provides lift only as long as it is moving. Let's say you have a kayak stabilised by a single foil, out to your right. If you turn right quickly, the foil may well be stationary in the water, leading to a capsize. Also, the sea is a pretty unpredictable place. If you are hit by a gust of wind from the right, your stabiliser may pop out of the water. Another instant capsize. For this reason, foil stabilisers tend to have some built-in flotation, either foam or inflatable, for when they aren't moving or the unexpected happens. Consider the original Triak - it did have hydrofoil stabilisers, but these were attached to buoyant amas about 1.5 metres long. It seems the foils were more trouble than they were worth, because in later models they have been dropped and the amas have increased in size to 2.35 metres long, so the Triak is now a miniature trimaran. A sail needs a mast. When the sail is working, some of the wind's energy goes into pushing the boat forwards but some pushes sideways against the mast, which acts as a lever and tends to capsize the boat downwind. A kite does not need a mast and has less tendency to capsize an unstabilised hull. However kites for upwind sailing are quite demanding. Small modern sailing boats almost inevitably have a triangular Bermudan sail. Efficient Bermudan sails have a high aspect ratio, which means a tall, heavy, expensive mast that has to be kept upright by permanent wire rigging attached to the bow and the sides of the hull. Sailing canoes like Yakaboo often have a batwing rig where semi-rigid battens are used to make a lower sail with a shorter mast but the same area. 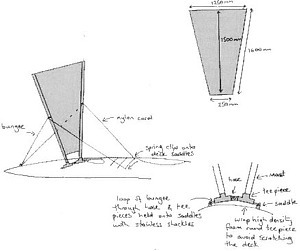 Bermudan and batwing sails function like a wing thanks to a surface which is curved in three dimensions. That means they have to be assembled by sewing together several precisely cut pieces of cloth. You could have a Bermudan or wing sail made by a sailmaker such as the kayak specialists Balogh Designs. Contact details at Kayarchy Shopping. If you want to try making your own, there's a specialist book by Todd Bradshaw Canoe Rig: The Essence & The Art, WoodenBoat Books, 2001. You could make a sail with a kit. 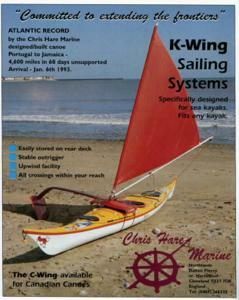 Sailrite sometimes do kits suitable for very small boats. At the time of writing, they do one for the 3.67 metre Wee Rob sailing canoe designed by Iain Oughtred. See Kayarchy Shopping. Manufacturers such as Peter Lynn and Ozone make steerable traction kites to tow wheeled buggies and for kitesurfing. Contact details at Kayarchy Shopping. The latter have to take off again when they crash onto water. That means either that the entire kite inflates, in the case of a parafoil; or the kite has an inflatable bladder across the front ("leading edge inflatable" or LEI) which defines its shape and keeps it afloat after a crash. Most water-relaunchable kites are too big to power a kayak except for short thrill rides. In the early days of kitesurfing there were a few nasty incidents when people lost control and got dragged along. Designers now ensure they have controls which de-power the kite easily and completely in an emergency. Typically this means a brake line as well as the control lines. Many have four control lines plus a brake line, so that's 150 metres of line to manage. It's easy to inflate a relaunchable kite and set up the lines and control bar while you are still on the beach, but we wouldn't want to try it at sea. All traction kites require constant attention, and small kites are usually twitchier than big ones. Kitesurfers usually use LEIs, in particular the arc-shaped bow kites which cost as much as a good mountain bike or a cheap secondhand car. Only part of these kites provides power. The rest provides stability and control. With parafoil kites, every square centimetre of kite provides power and a parafoil may pull twice as hard as an LEI of the same area. Peter Lynn Kites make a small water-relaunchable parafoil called the Waterfoil which looks rather like this. It's not very expensive, but it's not very user-friendly either. The Waterfoil can be flown with two control lines and a brake line. It is, or was, available in sizes down to 2.4 square metres or maybe smaller. Very nicely made of spinnaker fabric, it has a lot of thin nylon lines attached to the bottom. There are two small round holes in the leading edge. Inside each hole is an open-ended tube or sock which allows air into the kite but prevents it escaping. If there's enough wind, you can launch it and let it inflate in the air. If there's not quite enough wind, you can inflate it on the ground. About 75 puffs per side unless you have a pump. A Waterfoil is a possible solution for kayak sailing, and it's certainly fun trying. Here's your editor's test rig. Both he and it are the right way up, which makes a nice change. However the 2.4 m Waterfoil needs a Force 3 to fly and in a Force 5 it is capable of dragging a 90 kg man across the beach while seated or lifting a 50 kg woman right off the ground. Apparently the similar HQ Hydra and the Viron Flysurfer are much friendlier than the Waterfoil. Alternatively a small LEI kite intended for training novice kitesurfers may be a better way to power a sea kayak, if you are willing to spend the money. A Canadian canoe is wider than a sea kayak and has a flatter bottom. You could say that it is halfway between a kayak and a sailing dinghy. 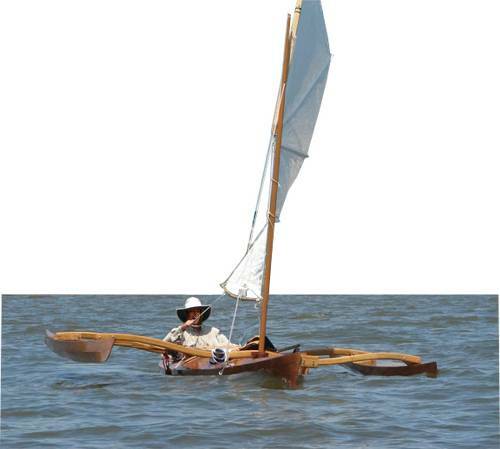 A canoe can carry a small sailing rig without needing a stabiliser. An ordinary touring canoe fitted with a mast, sail, leeboard and rudder can be sailed on sheltered waters, upwind or down. In the illustration, the 2 metre long object is one of the two leeboards. Most canoe sailors use shorter leeboards. Exposed waters? 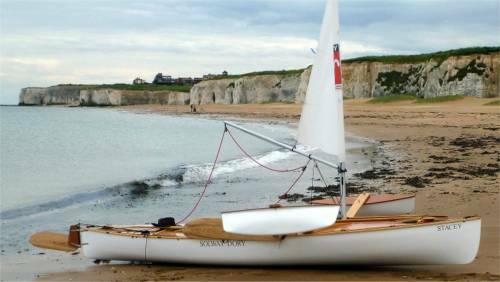 Well, in 2012 Gavin Millar went 1000 nautical miles round the coast of England and Scotland with this Shearwater sailing canoe from Solway Dory. 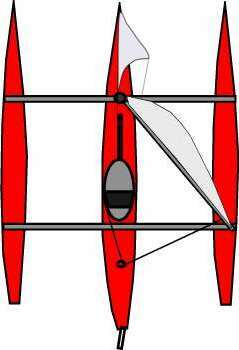 If you prefer relaxed sailing while sitting on the floor of the canoe and facing forward, a Canadian canoe can be fitted with stabilisers to turn it into a miniature trimaran, as with the kayak sailing rigs mentioned above. In theory, a rudder, leeboard or Bruce foil should be long and thin (it should have a high aspect ratio). Think of the wing of a sailplane. In practice, for a boat that sails in shallow water it is often better not to make your foils too deep. If you want to be able to sail a foil-stabilised boat right up the beach, you may even opt for foils which are wider than they are tall, as with the SkiSail. See Other Multihulls For Exposed Waters. Anything you hang into the water will create drag and slow your boat. To minimise drag, the cross-section of a rudder, leeboard or Bruce foil should be carefully shaped. As with an aircraft wing, you want a rounded (parabolic) leading edge and a sharp trailing edge. To get a better idea, have a look at a windsurfer skeg or the fins on a surfboard. Serious racers usually use one of the NACA or Clark cross-sections. For a leeboard or Bruce foil try a Google search on "NACA 0010" or "NACA 009" . The International Moth sailing dinghy wins the Kayarchy award for the most insane sailing device ever built in large numbers. It looks like an ordinary small racing dinghy until it reaches a certain speed, when its hull rises completely clear of the water using the lift generated by a few metres of NACA 63412, just 12 cm wide and 1.4 cm thick. They can go at over 30 knots, and they're not called sailors any more, they're riders. Part of the old UK Moth website was headed VaVaVoom. Nothing to do with sea kayaking but have a look anyway. The international Mothie site is at www.moth-sailing.org. And while we're digressing, check out the Trampofoil, a human-powered water device which doesn't have a hull, floats or any positive buoyancy at all, just foils. www.trampofoil.com. Leeboards and Bruce foils both need to be stronger than you might think. It is common to read of a home-designed and home-built boat which works very well except that the centreboard or leeboards broke on the first outing.